Cook Up Content That Converts Visitors into Leads! Are you producing the right content? Is it reaching the right people? Read up on the 5 steps to creating and running an effective content marketing program that makes sense for your business. You’re working on your third blog post this month... and grumbling as your task list continues to grow. Is this blog really worth the time? What is your business getting out of all this content writing? Well, if you’re doing it right, the answer is: sales. Make the most of the content you create. Engage your audience and build relationships. 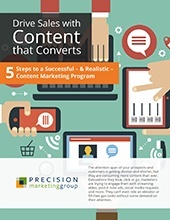 Measure your results, and continually refine your content to meet your sales goals... and more! No more blogging nightmares. Here's to a new and improved content marketing strategy! Simply fill out the form to get your free guide now.